There was an overwhelming turnout at Wednesday night&#39;s vigil in Woodburn Circle for those lost in Monday&#39;s tragedy at Virginia Tech. The event was hosted by the Student Government Association. President David Hardesty offered some remarks to all that gathered. "Any explanation we may offer may seem inadequate ... we must not give up hope for a better world," he said. "Violence can erupt in even the most peaceful of places ... each one of you is precious to your family and friends and to this University and to the future of this nation." Students have been showing their support throughout the week since the tragedy took place Monday in Blacksburg, Va.
Jason Parsons, SGA vice president, said the student response has been poignant since Monday. As of Tuesday, more than 800 electronic cards and 350 hand-written cards were sent to the Virginia Tech campus from students at WVU. On Wednesday SGA set out banners for the campus community to sign and to send messages of hope to those affected at Virginia Tech. Parsons said two banners were filled, and SGA members handed out over 1,000 maroon and orange ribbons for students to show their support for the Hokies. "It&#39;s been amazing to see the hearts of students on campus," Parsons said. The Center for Civic Engagement has also played a big part in sending thoughts and prayers to the students and faculty at Virginia Tech. Brett White, the administrative assistant of the Center for Civic Engagement, said besides helping SGA plan Wednesday night&#39;s vigil, they also have a booth set up in the Mountainlair for students to write their messages on index cards. The cards, which read "From Your Mountaineer Friends," will be sent by the Center of Civic Engagement to the Virginia Tech campus. But perhaps the most moving part of the week was Wednesday night&#39;s service. 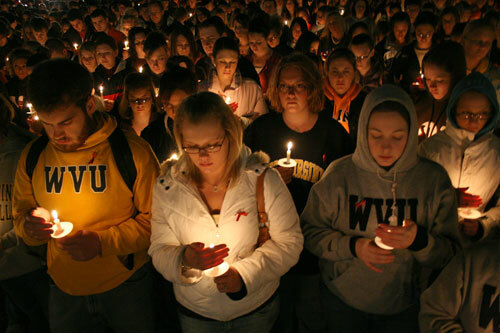 Over 3500 students and Morgantown residents gathered outside Woodburn Hall and held candles to honor the victims and their families of the Virginia Tech massacre. SGA President David Kirkpatrick welcomed the crowd. Then there was a moment of silence. At exactly 9 p.m., three chimes rang from the bell of the U.S.S. West Virginia which sits outside Oglebay Hall and is used as a memorial to students who have died. "We hope that tonight&#39;s vigil, through words and music and reflection, begins healing," Kirkpatrick said. "Thirty-three men and women lost their lives in Blacksburg on Monday, and tonight our heartfelt prayers go out to the families," Parsons said. He then introduced Seyran Celik, a Morgantown resident who attends Virginia Tech. Celik shared her story from Monday with the crowd, saying through tears that she lost two friends that day. She said she has received numerous e-mails from friends and family at WVU with the same recurring sentence: "WVU stands with VT."
"I am honored that West Virginia University has become an extension to the Virginia Tech family," Celik said. Kasey Hott, a journalism major and the Mountaineer Idol winner, and Justin Johnson, a history major, sang "There You&#39;ll Be." Kirkpatrick then gave closing remarks, letting students and faculty know activities will take place throughout the rest of the week for the WVU campus to continue their loving support to the Virginia Tech community. Tricia Fulks (Author)/Billy Wolfe (Photo), “WVU mourns,” The April 16 Archive, accessed April 24, 2019, http://april16archive.org/items/show/1700.